I am just loving the Little Oratory. This is a slow read because I want to focus and take it all in. The writing is a treat to read and so are the sketches in it! The whole book is just beautiful! 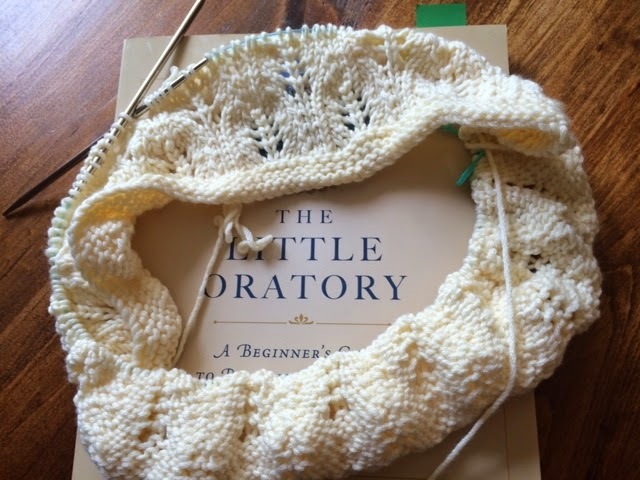 I'm starting a lace baby blanket for my cousin's baby. I love knitting baby blankets. They are always so beautiful and I find them to be a relacing knit. You can really get to know that pattern with the long rows and repititions. For some reason, I find scarves, with their short rows that seemingly go on forever more frustrating. So knitting this blanket is a true treat for me! There is a Mama's Notebooks giveaway at Carrots for Michaelmas this week. Come on over and enter for a free notebook of your choice! On Real Housekeeping, I am continuing my Crunchy on a Budget Series as well as publishing recipes like my Simple Summer Salad. I'm with you in your opinion of scarves. All I can think when I knit one is, "Are we done yet?" But blankets, now---my expectation is that it will take a long time, and therefore I'm more patient about it. Go figure. I feel the same exact way about scarves! But there are so many beautiful ones, so I attempt them anyway. 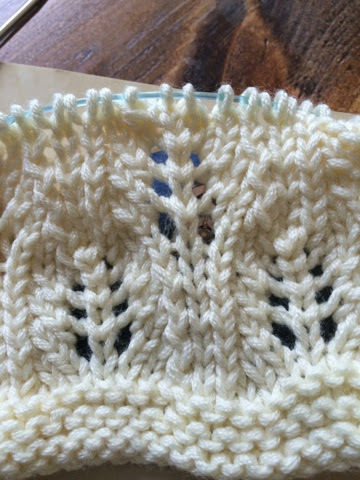 Knitting them lengthwise seems to help, or knitting in two parts and grafting.